Problem: Calcium is an important nutrient which helps provide structure to the cannabis plant and helps it withstand stress like from heat. A cannabis calcium deficiency can sometimes be difficult to diagnose since calcium deficiencies are often accompanied by magnesium, iron, and/or other cannabis deficiencies. Calcium moves relatively slowly through the plant (it is a semi-mobile nutrient), which means it tends to "stay put" after it's been given to a leaf. 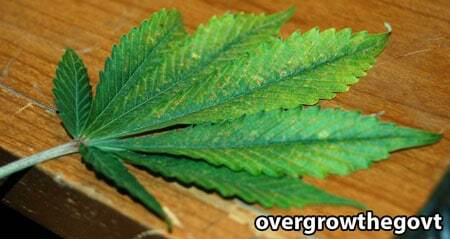 It tends to show up on leaves that are actively growing and getting some amount of light. This lower fan leaf is mostly in the shade, but the calcium defciency appears near the edges that are getting light. 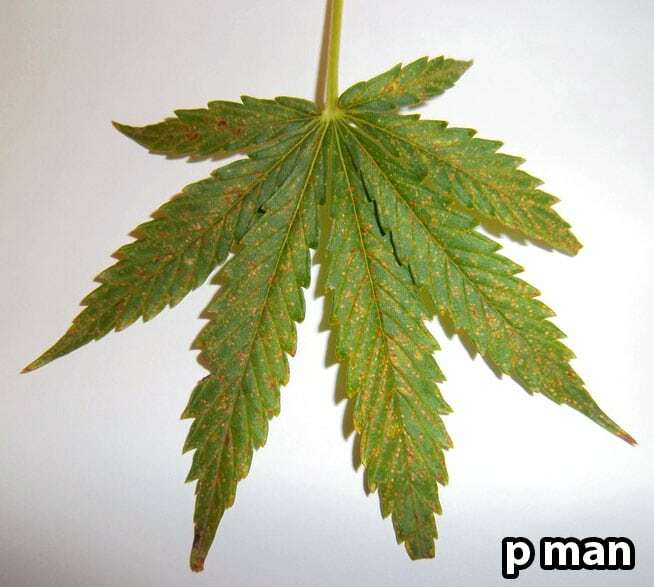 Calcium deficiencies often show up on parts of the leaf that are still actively growing. 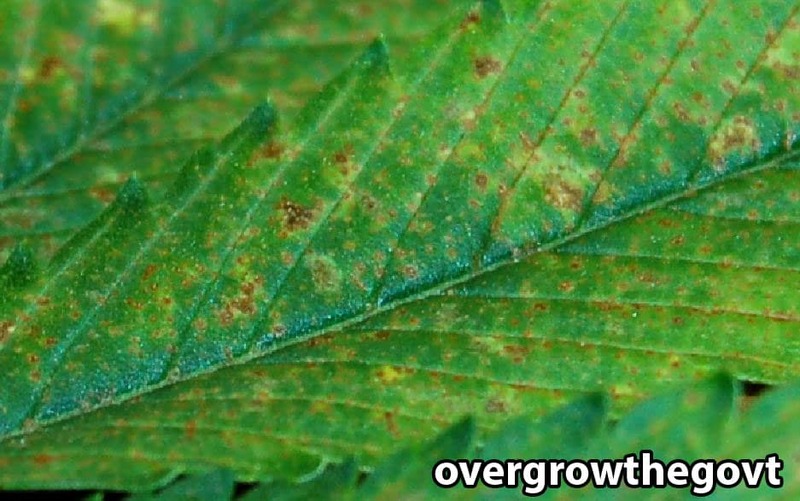 Calcium deficiencies tend to appear on newer or growing leaves, which means calcium deficiencies first appear on leaves where there's rapid vegetative growth. 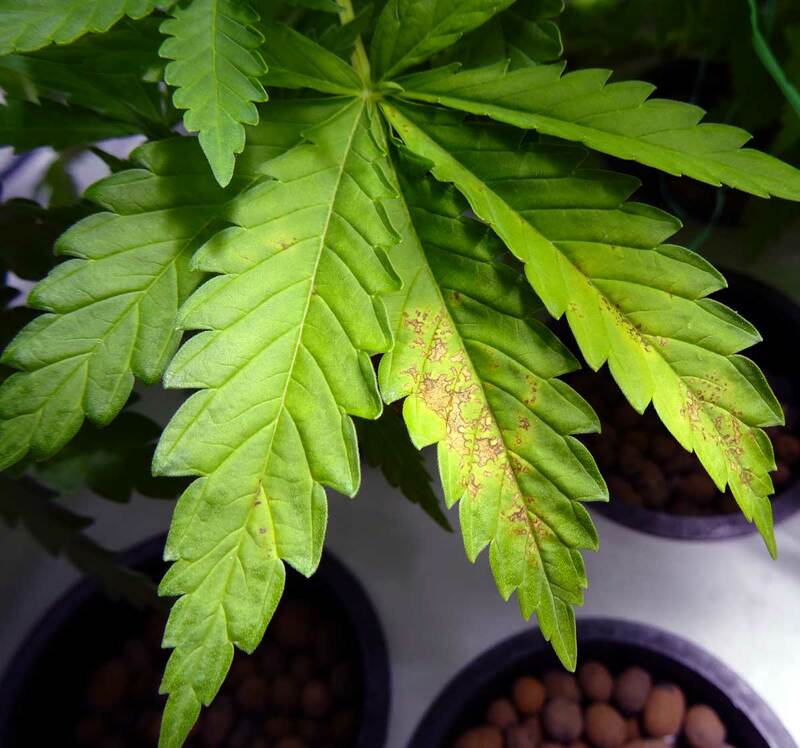 If a cannabis plant is affected by a calcium deficiency for too long, it may begin to show the following symptoms due to the lack of calcium. Cannabis tends to like high levels of calcium, so it is unusual to feed too much calcium when using normal amounts of nutrients and/or regular soil. There are not many known cases of cannabis calcium toxicity (too much calcium), however too much calcium can cause the plant to lock out other nutrients, so it's important not to go overboard.. Different strains of cannabis tend to have different nutrient problems. 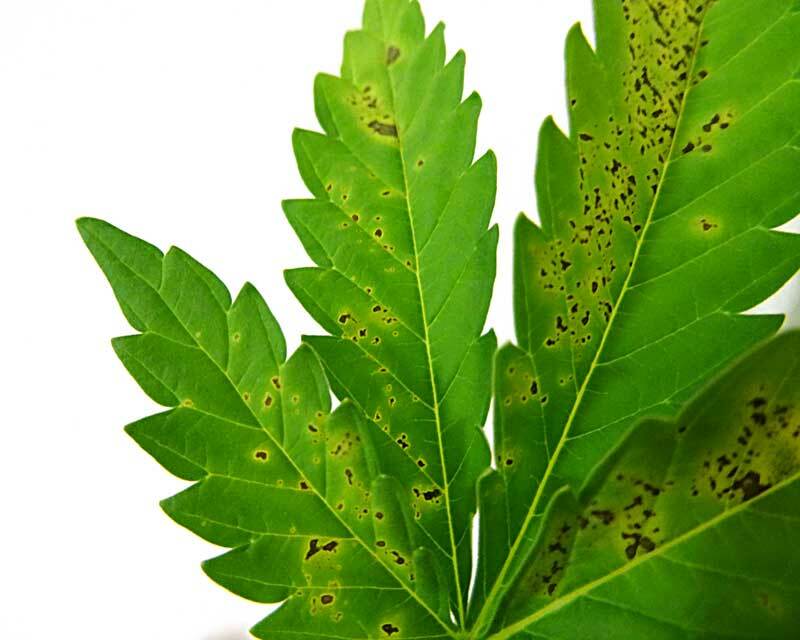 Some cannabis strains (or even specific plants) tend to use much higher levels of calcium than others, and so you may see calcium deficiency problems with one plant even when all the other plants (which are getting the same nutrients and environment) aren't showing any signs of deficiency. 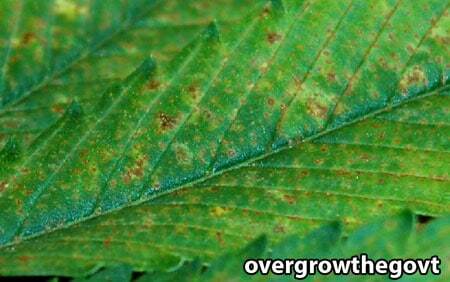 Your cannabis plant may show signs of a calcium deficiency if the pH at the roots is too high or too low. 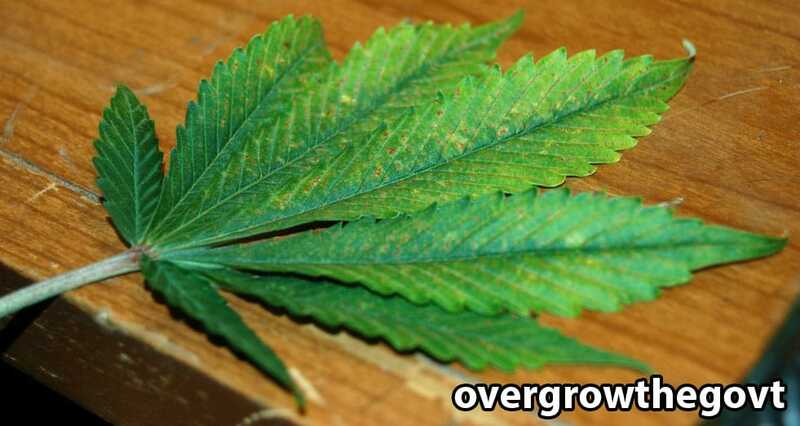 That is because when the pH of your root zone is off, your cannabis cannot properly absorb calcium through its roots. Therefore the first step is to ensure that you have the correct pH for your growth medium. Learn more about pH and cannabis. Please note: After a calcium deficiency is cleared up, the problem (brown spots and unhealthy new leaves) will stop appearing on new growth, usually within a week. 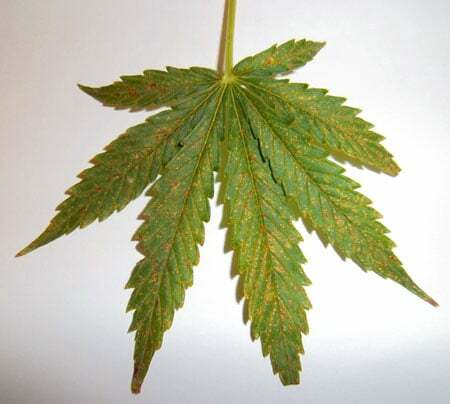 Please note that leaves which have been damaged by a calcium deficiency will probably not recover or turn green, so you want to pay attention to new growth for signs of recovery. If you suspect your growing cannabis plant has a calcium deficiency, flush your system with clean, pH'd water that contains a regular dose of cannabis-friendly nutrients that includes calcium. This will remove any nutrient salts that may be affected the uptake of calcium and help restore pH to the proper levels..
Calcium, magnesium, and iron deficiencies often appear together in cannabis. Many growers decide to purchase some sort of Calcium-Magnesium (often called Cal-Mag) supplement for their grow room in case this common deficiency appears. Listed below are common cannabis Calcium supplements, along below with some general information about each one. After supplementing with Cal Mag and correcting the pH, you should expect to see new healthy growth within a week. Remember, the old leaves will probably not recover, but new growth should be green and healthy. Botanicare Cal-Mag Plus is a calcium, magnesium, and iron plant nutrient supplement. 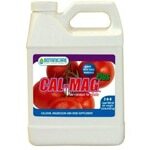 General application is to mix 1 tsp (5ml) of Cal-Mag into each gallon of water. I have used Cal-Mag Plus several times with great results. If you're looking for a way to supplement calcium in your organic or soil setup, I highly recommend a product called "Dolomite Lime." Dolomite is a good source of calcium and magnesium and can be mixed with your soil. The great thing about dolomite is it works slowly over the course of a few months. Dolomite has a neutral pH of about 7.0 and will help keep soil at the correct neutral pH range which is optimum for cannabis growth. You can buy Dolomite Lime online, but with shipping it's almost always waaaay cheaper to pick up a bag at a home improvement or gardening store such as Lowes, Home Depot, gardening centers, etc. If possible, try to get a finer grade of dolomite compared to something that is more coarse. How to Use Dolomite Lime for Cannabis: When growing cannabis indoors, add 6-7 teaspoons of fine dolomite lime to each gallon's worth of soil. So if you're mixing enough soil to fill a 5 gallon container, you want to add 30-35 teaspoons (about 2/3 cup) of dolomite lime to the mix. Mix the dolomite lime and the dry soil thoroughly, then lightly water it with water that has been pH'ed to 6.5. After getting the soil wet, mix the soil well and wait a day or two to let the soil settle before checking the pH and adding plants. When growing in an outdoor garden, follow the dolomite lime manufacturers instructions.